"A friend of mine made this, and I just had to have the recipe. And it is the best tasting quiche I have had in years. Never any complaints when I make it. Great for a fall/winter dinner with a cup of soup." Place the bacon in a large, deep skillet, and cook over medium-high heat, turning occasionally, until evenly browned, about 10 minutes. Drain the bacon slices on a paper towel-lined plate. Chop when cool. Fit the pie crust into a 9-inch pie dish, and set aside. In a bowl, whisk together the eggs, cream, salt, black pepper, Worcestershire sauce, and hot pepper sauce. Spread the spinach into the bottom of the pie crust; top with bacon, Cheddar cheese, and green onion. Pour the egg mixture over the filling, and sprinkle the quiche with Parmesan cheese. Bake in the preheated oven until the top is lightly puffed and browned, and a knife inserted into the center of the quiche comes out clean, 35 to 45 minutes. Sometimes I don't use all the spinach, green onions, bacon, and sharp cheese; adjust to your own tastes. Also one more tip: put a sheet pan under quiche pan, just in case of spillage as it bakes. This was awesome. Frying the bacon took the longest amt of time. I think maybe next time I will try to just mix it all together instead of layers. Thanks for the great breakfast! I followed recipe to a t except I just mixed everything all together and poured into pie shell. 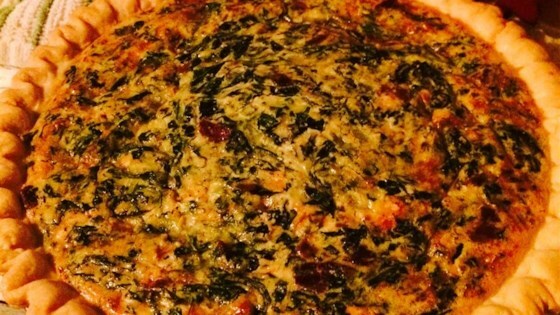 I have a new favourite quiche recipe!